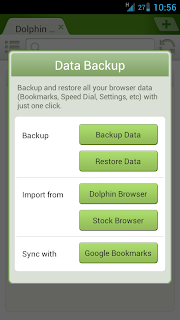 Dolphin Browser HD is arguably the best Android browser. There is also a light version of the browser like Opera Mini which is very useful for mid-range mobile devices. Dolphin Mini has retained most of the features of it's superior version Dolphin Browser HD. It comes with a cool Data Backup feature, User agent feature where you can make visit a website like an iPhone or iPad.